Image: Createability Interns with Minister Harwin, Accessible Arts and Create NSW. 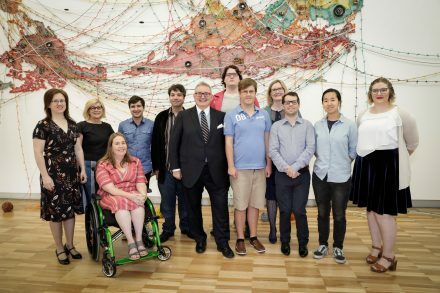 L-R: Naomi Malone, Kerry Comerford (Accessible Arts CEO), Michelle Brown, Joel Pragnell, Dan Graham, Minister Harwin, Adam Jones, Thomas Hamilton, Alex O’Mara (Deputy Secretary Create NSW), Jack Dowdell, Cindy Zhi, Jessica Lubbe. Artwork: Reena Saini Kallat, Woven Chronicle 2018, circuit boards, speakers, electrical wires and fittings, sound component, dimensions variable. Art Gallery of New South Wales, Roger Pietri Fund and Asian Benefactors’ Fund 2018. © Reena Saini Kallat. NSW’s creative institutions are set to broaden their horizons as they welcome aboard the ten NSW artists and practitioners selected as part of the Createability Internship Program. Michelle completed a BA in Communications and Cultural Studies and a Graduate Diploma in Education. In 2017 she completed a Diploma in Visual Arts at TAFE NSW and was named the regional winner of a NSW industry training award for Vocational Education and Training Student of the Year (2017/18) and is a State finalist for this award. Michelle was selected as an artist with both Little Orange Studio at Campbelltown Arts Centre (CAC), and Front Up from Ability Options. She was an Ability Linker with Ability Links NSW from 2015-2018, working on a number of community and cultural events in an advisory role including the Camden Council’s Art Unearthed competition and Wollondilly Council’s Stars in the Garden 2017. Program of activity: Internship at the Museum of Contemporary Art Australia (MCA) commencing in early 2019. Michelle’s role at MCA will include assisting the MCA Artist Educators with program development and delivery. Michelle will also be working towards the delivery of professional development workshops for artists with disability, with activities forming part of the MCA’s Art is for Everyone weekend in 2019, delivered in partnership with the Tate. Jack has a Diploma in Film and Television from North Sydney TAFE and a Bachelor of Arts from UNSW. Jack worked for the NSW Police Force in the Multimedia Unit as a production assistant for four years, cutting media packets, editing internal events and training videos, and uploading content to social media. Prior to this, he completed work experience at the ABC as an assistant editor. Jack created and ran a movie review website for four years, which had international readership and is currently collaborating on a feature film script. Program of activity: Internship at Goalpost Pictures commencing in early 2019. Jack will be working as a Production/Development Assistant with Goalpost Pictures. He will be assisting with activities across development, production, marketing and delivery/post-production. His work plan includes reading and assessing film and television scripts, research and document presentation and general production assistant work on all Goalpost projects, including projects currently in post-production. Dan has a BA and MCA (Theatre Directing) from UTAS, Honours in Performance Studies from The University of Sydney and a Certificate IV Training and Assessment from TAFE, NSW. He has attended two Directing Labs in the USA (Directors Lab Chicago 2016 and Directors Lab West in LA 2018). Dan served a term on the Board of Accessible Arts Australia and has spoken on panels, run workshops and acted as an advocate for artists with a disability. Program of activity: Internship at the Sydney Opera House commencing in early 2019. For the first part of his internship, Dan will concentrate on Front of House and customer service as part of the Sydney Opera House’s Welcome Team. For the second part of the internship, Dan will conduct a research and development project on accessible companies and artists. During his internship he will also work across Sydney Opera House Presents, the Opera House’s programming arm which encompasses Children, Families and Creative Learning, Contemporary Performance, Contemporary Music, Classical Music, Talks and Ideas and First Nations programming. Thomas is currently the Queer Producer for the National Young Writer’s Festival affiliated with the This Is Not Art Festival. He was Social Media and Office volunteer for Queer Screen and was a team member at the promotional stall at Mardi Gras Fair Day. Thomas has worked as volunteer for the Bollywood 101 Film Festival, Tropfest, Mardi Gras Film Festival and the Newcastle Writer’s Festival. Thomas has a Bachelor of Communication with Media Studies major at the University of Newcastle (2017). He has taken several courses at the Australian Film, Radio and Television School, including Intro to Radio, Intro to TV/Radio Presenting and Screenwriting for Short Film, and has contributed to online publication Sticky Trigger Entertainment. Program of activity: Internship at the Sydney Festival commenced in November 2018. Thomas will be engaging across all areas of the Sydney Festival organisation during his internship. Core activities include programming and administration support, assistance with media and communications, research and information collation, on the ground delivery of the festival, customer relationship management philanthropy administration and writing and uploading content for the Sydney Festival website. Adam is an active member of Campbelltown Arts Centre’s (CAC) Little Orange program, a supportive studio for artists that identify with disability. While at Little Orange he gained insights into the working of a museum, including installation, collection management and exhibition design. During the Sheer Fantasy exhibition (CAC, March 2018) Adam volunteered within the installation team, which included sanding, layout, handling work and painting. He was commissioned to create and perform The Great Samhaim and the Ugly Mugs (Fisher’s Kids Program, Fishers Ghost, CAC) and delivered an artist talk where he described the mysterious and arcane properties of his totems displayed in the Fishers Ghost Art Award. Program of activity: Internship at Campbelltown Arts Centre commencing in early 2019. Adam will be engaged as an Assistant Curator within the Visual Arts department at Campbelltown Arts Centre. This role will involve assisting with the administration of Suzanne Archer’s upcoming exhibition, including; site visits, research, development of contracts and liaising with artists and installation crew. In addition to this Adam may also be given opportunities to assist with workshops, events and activations responding to the exhibitions. Jessica is currently a Junior 3D Generalist at UTS/Animal Logic Academy and has extensive experience across a range of arts, screen and cultural organisations where she freelanced as a 3D artist, texture artist and graphic design artist. Jessica has a Masters of Animation and Visualisation from UTS (2018), a Diploma of Graphic Design from Billy Blue (2017) and an Advanced Diploma of Screen & Media – 3D Animation & VFX Film, AIE (2013). Program of activity: Internship at Animal Logic commencing in early 2019. Jessica will be working as a Digital Artist, Modelling intern at Animal Logic. Jessica will be working with Artist Manager Mel Jones and will be appointed a mentor during her internship. Jessica will be working on real projects alongside Animal Logics’ highly experienced and talented team in a world-class digital and film production studio. Naomi is an emerging cultural practitioner, emerging professional historian and a trained lawyer. After working at the ABC in legal and policy advising and project management and work opportunities, Naomi began her PhD, researching the history of deaf education in NSW since World War II. She graduated with a PhD in 2018 from UTS, Sydney, which is set to be published by Washington-based academic press, Gallaudet University Press, in the USA. Since December 2017, Naomi has been researching and writing a book about the history of The Shepherd Centre, an organisation dedicated to teaching deaf and hearing-impaired children spoken language. Naomi is the Chair of the State Library of NSW’s Inclusion Advisory Committee and serves on the Australian Museum’s Accessibility and Inclusion Advisory Committee and NSW Anzac Memorial Centenary Project Accessibility Advisory Panel. Program of activity: Internship at Art Gallery of NSW commencing late 2018. Naomi will be engaged across several areas of the Art Gallery of NSW during her internship, with her workplan currently being developed to suit her skillset. Greg has worked as a freelance writer and developer with The Full Box and Torrid Films writing and developing TV series as well as a consultant producer with Tumble TV and the Seven Network producing two seasons of the children’s television series Spit It Out. Greg has completed a Bachelor of Arts at Sydney University, an Advanced diploma at AFTRS in both Screenwriting and Script Editing for Film and Television as well as numerous other film and television short courses. Greg has also written several feature film scripts, written, directed and produced several short films and written and performed stand up. Program of activity: Internship with Jungle Entertainment commencing in early 2019. Greg will work as a Development Assistant with Jungle Entertainment. His work plan includes activities such as reading/reporting on project applications, note-taking in writers’ rooms and advising on characters with disability on Jungle’s upcoming projects. Joel was the editor for Louie (KR ONE) Gasparro 5Pointz, a short documentary which has won multiple independent film awards, including Best Editing at the Melbourne City Independent Film Awards. Joel has worked across many projects including editing for FitKids and NSW Physical Disability Rugby League. He has worked as an extra in TV, music videos and a feature film, and was also credited with writing an article for The Chaser and listed as a writer for their 2017 Annual issue. Joel has completed a Bachelor of Communications and Media and a Certificate IV in Screen and Media as well as a Certificate III Media TVET course. Program of activity: Internship with ABC Play School commenced in October 2018. Joel will be working as an Edit Assistant on ABC Play School. His work plan includes post production edit assistant work on Play School episodes and Through the Windows segments, editing online content and observing rehearsals and studio recording. Cindy is currently studying a Bachelor of Design in Animation at UTS. She has had formal training in industry-level software such as Adobe Photoshop, After Effects, Illustrator, InDesign and Premiere Pro. Cindy has undertaken basic training in animation software such as Maya and Toon Boom Harmony. At the beginning of 2018 Cindy had an internship with The Conversation as an editorial illustrator where she collaborated with editorial staff and authors to create illustrations for topics, covering a range of topics from ‘Curious Kids’ to science, politics and finance. Cindy’s freelance experience involved handling a client base and providing illustrations and designs for their business and organisations. Program of activity: Internship with Animal logic commenced in November 2019. Through the internship with Animal Logic, Cindy will visually explore the written scene or key moment of any project. Throughout the internship Cindy will develop her practical skills and gain knowledge of how the art department works in an animation studio. Cindy will support the creative team to help them produce work as well as produce elements of creative work as required.